Place cashews in a small bowl and cover with cold water. Soak the cashews for 1 hour up to overnight (if soaking overnight, keep them refrigerated). Drain and rinse the cashews. 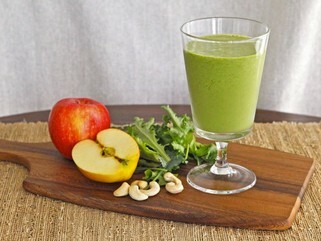 Pour 1 cup cold water into the blender along with the cashews. Blend till the cashews and water look like milk. Add one handful of the apple chunks. Blend till the mixture is liquid. Continue adding the apple and banana in small handfuls, blending each handful one at a time, till all of the fruit chunks are blended in. Add the greens, one handful at a time, and blend thoroughly. Add the ice cubes, cinnamon, nutmeg and stevia. Blend till the ice cubes are thoroughly crushed and the mixture is smooth. Try at least 1 minute to make sure all of the greens are totally pulverized. You may need more or less ice cubes depending on the size of your cubes-- just add them till the mixture is thick and milkshake-like in texture. Divide the smoothie between two large glasses and serve. There may be a little left over, which you can use to top off the glasses after sipping them down a bit. Note: It's a good idea to follow the steps in the order suggested. If you simply cram all the ingredients into the blender at once, they won't always blend properly.